Jamie Lawson releases music video for new single 'The Answer' taken from forthcoming album! 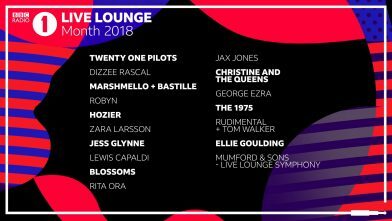 The 1975, Rita Ora, Twenty One Pilots and Mumford & Sons are among some of the artists stepping into the world famous Live Lounge this November on BBC Radio 1. Hosted by Clara Amfo in the new weekday slot of Monday to Thursday, artists will perform their own music, as well as their chosen cover tracks. The Live Lounge sessions will be hosted by Clara Amfo (Monday-Thursday, 10am-1pm) with performances available to watch on BBC Radio 1’s iPlayer and YouTube channels.